This study aimed to review quantitative literature pertaining to studies of music-based interventions in palliative cancer care and to review the neurobiological literature that may bare relevance to the findings from these studies. A narrative review was performed, with particular emphasis on RCTs, meta-analyses, and systematic reviews. The Cochrane Library, Ovid, PubMed, CINAHL Plus, PsycINFO, and ProQuest were searched for the subject headings music, music therapy, cancer, oncology, palliative care, pain, anxiety, depression, mood, quality of life, prevalence, neuroscience, functional imaging, endogenous opioids, GABA, 5HT, dopamine, and permutations of these same search terms. Data for the review were comprised of articles published between 1970 and 2012. References of all the cited articles were also reviewed. 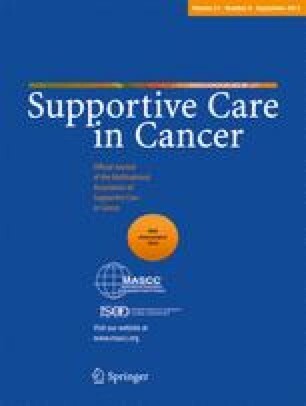 Available evidence suggests that music-based interventions may have a positive impact on pain, anxiety, mood disturbance, and quality of life in cancer patients. Advances in neurobiology may provide insight into the potential mechanisms by which music impacts these outcomes. More research is needed to determine what subpopulation of cancer patients is most likely to respond to music-based interventions, what interventions are most effective for individual outcomes, and what measurement parameters best gauge their effectiveness. Thanks to David Aten of MDACC Medical Graphics & Photography for illustrating all figures and to Mei Dong and Biquan Luo for the help with translation. I have no financial relationships to disclose. I have full control over the content of this article. I submit the entirety of this manuscript for review by Supportive Care in Cancer.